Don't eat at the 5th Avenue Deli - Bad customer treatment. Part of being in the restaurant business is taking complaints from customers. Through the years, as a frequent restaurant customer and as an advertising agency owner who worked with a number of restaurants, I've heard all kinds of complaints. Good restaurants do what they can to make the customer happy. What I saw last Thursday, I've never seen before at a restaurant and that is why I'm telling you don't eat at the 5th Avenue Deli & Grill in the Eastgate Shopping Center in Mayfield Heights, OH. Two friends of mine and I were looking for a place to eat after moving our buddy Al (not his real name) into a new apartment across the street from the Eastgate Shopping Center. We thought we'd hit the center and see what restaurants were there. 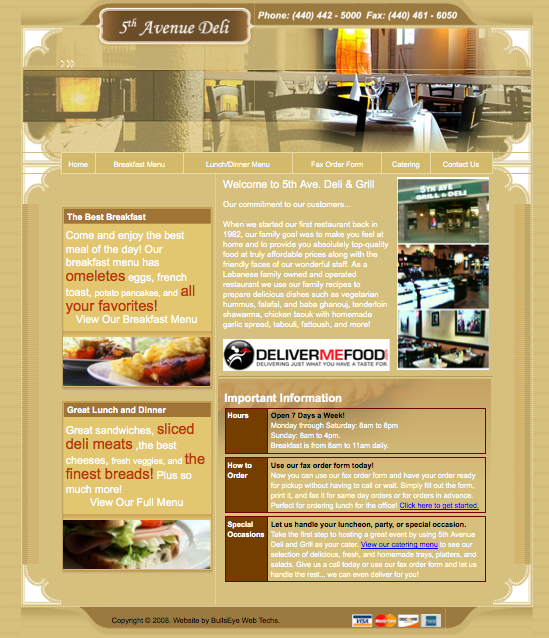 The first place we came across was the 5th Avenue Deli & Grill. I like good deli fare and this seemed like a suitable place. Our waitress seated us at a four-top table. However, our friend Jacob (not his real name) is a bit of a quirky guy. He sat at a two-top table next to us. Odd, but that is Jacob. He also had to make a production out of ordering. He had to see all the menus the restaurant offered - breakfast, lunch, dinner. I made my selection quickly and easily, a corned beef sandwich. It was a bit pricey at $6.95 and didn't come with anything but a pickle. But Al was buying and I wasn't too concerned. Al was wiped out after moving into his new apartment and wasn't hungry, he ordered a glass of water with lemon. Jacob fretted over all of the selections on the collections of menus he had in front of him. After much deliberation, he decided on one scrambled egg. Odd, but that's Jacob. My corned beef sandwich came and it looked fine. The side of horseradish proved to be piquant, the way I like it. As I ate my sandwich, Jacob made a comment that their was something crunchy or granular in his lone egg. I would have swallowed a single egg in two bites and wouldn't have noticed if there was a fork stuck in the egg. Jacob, though, has a nervous personality and things have to be just so - the granular bits in his egg were too much for him. He politely asked the waitress over and explained to her what the problem was. She asked if he wanted another egg, he declined. Usually, a waitress will offer other selections, "Do you want toast, a bagel, a pastry?" But she didn't, took the plate with half an egg on it and left. We got our checks while I was still eating my sandwich. Jacob was handed a check for $1.45 for his egg, which he said he couldn't eat and only managed to try a few bites before spitting out the egg in his napkin. He asked the waitress, "What's this for?" She said he would have to talk to the cook. From the open kitchen, came strolling the tall cook with his silver hair slicked straight back, a white apron around his waist. He towered over the meek Jacob and asked him what the problem was. Jacob calmly explained that there was something grainy in his egg and he couldn't eat it. Immediately, the cook, who may have been one of the Lebanese owners, said he cooks eggs all day and there is never a problem. Jacob said, "I'm not concerned with someone else's egg, mine had something in it. I spit it out. Do you want to see my napkin?" The cook's temperament changed instantly, he was insulted and angry. "NO, I don't want to see you're napkin. I never have a problem with my eggs. What the hell are you trying to do? I don't work for free. You can get out of my restaurant." And he physically escorted Jacob by the arm to the door and yelled at him, "And don't ever come back." Meanwhile, Al and I were sitting there watching this drama unfold, as I was finishing my sandwich. Jacob is quirky, but he was polite and plaintive and in his mind there was a problem. In a normal restaurant, it would have been a - We're sorry moment - his bill would have been ripped up and that would have been it. Al and I sat for a few minutes at the table, while Jacob was outside waving at us. We went up to pay the bill. I asked the lady at the register, who seemed to be another one of the family owners, if they had a Take-Out menu. She said no. I asked her if they had a website. She said no. (Well, I got the pictures and address above and below FROM THEIR WEBSITE.) Stupid. Just plain stupid. The home page of the website they said they didn't have. Why did she lie to me about the website? Was she lying about the Take-Out menus? I can forgive a lot of mistakes at restaurants. I understand that it is a hectic business and the people serving you are humans. Tonight, at Denny's, where I am a regular (FREE WiFi), the waitress forgot to put in my onion ring order. Then it came out in a To-Go box and cold. I wound up with a double order. They made the mistake. They made good on it. One mistake I can never forgive is someone lying to me. THEY HAVE A WEBSITE. I also cannot tolerate rude staff members. If Jacob was making a scene, I could have envisioned the outcome he was handed. But he was polite and honest. Maybe this is the way Lebanese family businesses are run? I sure hope not. I like falafel. I have seen a lot of people who should have been thrown out of a restaurant - drunks, obnoxious people with a convoluted sense of self-importance, whiners, people who insult the wait staff or the chef, destructive people - horrible stuff. But to toss someone out because their egg wasn't right, that is just plain nuts. Apparently, they didn't want "our kind" coming back in their precious little deli. Well, these are hard economic times. Consumers have a lot of choices. At a business, your customer service should be outstanding; not brutish. 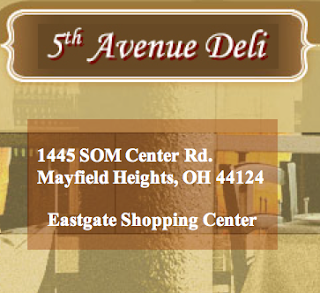 What that cook did was way out of line and that's why I'm recommending you don't eat at the 5th Avenue Deli in the Eastgate Shopping Center in Mayfield Heights, OH. Take that egg and shove it. And pass the word. Otherwise, you might get thrown out for asking for ketchup.